Copper (symbol Cu, atomic number 29) is one of the oldest known metals in human history. Reddish orange in color, it is ductile, malleable, and an excellent conductor of heat and electricity. In its ionic form, copper is an essential element for higher plants and animals, as well as for the human body. Copper and its alloys are extensively used for electrical wiring and machines, electronic components, structural materials, cooking utensils and flatware, coinage, musical instruments, and sculptures. In addition, as copper is a biostatic material, copper surfaces and doorknobs are used in hospitals to prevent the transfer of germs, and copper (II) sulfate is used as a fungicide. Copper was an important resource for the early Greeks and Romans. The Greeks named the metal chalkos (χαλκός). In Roman times, it became known as aes Cyprium—aes being the generic Latin term for copper alloys such as bronze (copper alloyed with tin), and Cyprium indicating that much of the copper was mined in Cyprus. From this, the Latin word became cuprum, which was eventually anglicized to copper. In mythology and alchemy, copper was associated with the goddess Aphrodite/Venus, based on its lustrous beauty, its ancient use in producing mirrors, and its association with Cyprus, which was sacred to the goddess. In alchemy, the symbol for copper was also the symbol for the planet Venus. Copper was known to some of the oldest civilizations on record and has a history of use that is at least ten thousand years old. A copper pendant was found in what is now northern Iraq, dates to 8700 B.C.E. 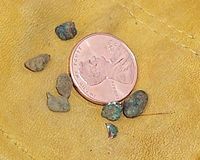 By 5000 B.C.E., there are signs of copper smelting, the refining of copper from simple minerals such as malachite or azurite. Copper was the first metal to be smelted from ores. The earliest signs of gold use, by contrast, appear around 4000 B.C.E. The oldest known cast copper object is a mace head recovered from Can Hasan in southern Anatolia and dated to around 5000 B.C.E. There are artifacts made of copper and bronze (copper alloyed with tin and sometimes other elements) from Sumerian cities that date to 3000 B.C.E., and ancient Egyptian artifacts in copper and bronze nearly as old. In one pyramid, a five thousand-year-old copper plumbing system was discovered. The Egyptians found that adding a small amount of tin made the metal easier to cast, so bronze alloys were found in Egypt almost as soon as copper was found. The use of copper in ancient China dates to at least 2000 B.C.E. By 1200 B.C.E., excellent bronzes were being made in China. Note that these dates are affected by wars and conquests, as copper is easily melted down and reused. In Europe, Oetzi the Iceman, a well-preserved male dated to 3200 B.C.E., was found with a copper-tipped axe whose metal was 99.7 percent pure. High levels of arsenic in his hair suggests he was involved in copper smelting. Brass, an alloy of zinc and copper, was known to the Greeks but first used extensively by the Romans. Different civilizations of the world went through a "Bronze Age" during different but overlapping time periods. For instance, the Near Eastern Bronze Age is thought to have stretched from 3500 to 1200 B.C.E. ; the British Bronze Age is dated from 2100 to 700 B.C.E. ; and the Central European Bronze Age was from 1800 to 700 B.C.E. The transitional period in certain regions between the preceding Neolithic period (New Stone Age) and the Bronze Age is termed the Chalcolithic, with some high-purity copper tools being used alongside stone tools. During the Bronze Age, copper was mined in the British Isles mainly in the following locations: South West County Cork, West Wales (such as Cwmystwyth mine), North Wales (for example, Great Orme), Anglesey (Parys Mountain), Cheshire (Alderley Edge), the Staffordshire Moorlands (for example, Ecton mine), and the Isle of Man (between England and Northern Ireland). In America, copper mining began with marginal workings by Native Americans and some development by early Spaniards. Europeans mined copper in Connecticut as early as 1709. Westward movement also brought an expansion of copper exploitation, with developments of significant deposits in Michigan and Arizona during the 1850s and in Montana during the 1860s. Copper was mined extensively in Michigan's Keweenaw Peninsula, with the heart of extraction at the productive Quincy Mine. Arizona had many notable deposits, including the Copper Queen in Bisbee and the United Verde in Jerome. The Anaconda in Butte, Montana, became the nation's chief copper supplier by 1886. Copper has also been mined in Utah, Nevada, and Tennessee, among other locations. Native copper also forms in uneconomic placer deposits. Copper ores are mainly found in Chile, United States, Indonesia, Australia, Peru, Russia, Canada, China, Poland, Kazakhstan, and Mexico. Most copper ore is mined or extracted as copper sulfides from large, open-pit mines in porphyry copper deposits (copper orebodies in porphyritic rock) containing 0.4–1.0 percent copper. 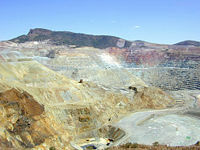 Examples of open-pit copper mines include Chuquicamata in Chile and El Chino Mine in New Mexico. The Intergovernmental Council of Copper Exporting Countries (CIPEC), defunct since 1992, once tried to play a similar role for copper as OPEC does for petroleum. It did not, however, achieve the same influence—not least because the second-largest producer, the United States, was never a member. Formed in 1967, its principal members were Chile, Peru, Zaire, and Zambia. In the periodic table, copper is a transition metal in period 4, between nickel and zinc. 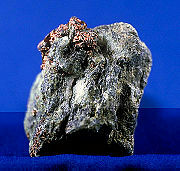 In addition, it is in group 11 (former group 1B), along with silver and gold, and it shares a number of characteristics with them. Like silver and gold, copper has high thermal and electrical conductivity (among pure metals at room temperature, only silver has higher electrical conductivity). All three are ductile and malleable metals—that is, they can be readily drawn into wires or beaten into sheets. Gold and copper are the only colored metallic elements besides cesium, the alkali metal in period 6. Copper has its characteristic reddish orange color because it reflects red and orange light and absorbs other frequencies in the visible spectrum. Upon exposure to the atmosphere, the surface of the metal becomes converted to copper carbonate (CuCO3), a green substance referred to as patina. The purity of copper is expressed as 4N for 99.9999 percent purity, or 7N for 99.9999999 percent purity. The numeral gives the number of nines after the decimal point. There are two stable isotopes of copper: 63Cu and 65Cu. In addition, there are a couple dozen radioisotopes. The vast majority of radioisotopes have half lives on the order of minutes or less; the longest lived, 64Cu, has a half life of 12.7 hours, with two decay modes that lead to two separate products. There are numerous alloys of copper—speculum metal is a copper/tin alloy, brass is a copper/zinc alloy, and bronze is a copper/tin alloy (occasionally with some other elements). Monel metal is a copper/nickel alloy, also called cupronickel. Although the term "bronze" usually refers to copper/tin alloys, it also is a generic term for any alloy of copper, such as aluminum bronze, silicon bronze, and manganese bronze. Copper is used extensively in a wide variety of products, as noted below. Electrical machines, especially electromagnetic motors and generators. Electrical relays, busbars and switches. Vacuum tubes, cathode ray tubes, and the magnetrons in microwave ovens. Wave guides for microwave radiation. In integrated circuits, copper is increasingly replacing aluminum because of its superior conductivity. As a material in the manufacture of computer heatsinks, as a result of its superior heat dissipation capacity compared with aluminum. Statue construction: The Statue of Liberty, for example, contains 179,200 pounds (81.3 tonnes) of copper. Alloyed with nickel, it is used for corrosion-resistant materials in shipbuilding. Roofing, guttering, and rainspouts on buildings. Doorknobs and other fixtures in houses. In cooking utensils, such as frying pans. Most types of flatware (knives, forks, spoons) contain some copper (nickel silver). Sterling silver, if used in dinnerware, must contain a few percent copper. Copper alloys are used in coinage. For example, U.S. pennies are 2.5 percent copper and 97.5 percent zinc by weight; nickels are 75.0 percent copper and 25.0 percent nickel; dimes and quarters are 91.67 percent copper and 8.33 percent nickel. Bacteria will not grow on a copper surface because it is biostatic. Copper doorknobs and copper surfaces are used in hospitals to reduce the transfer of disease-causing microbes. Legionnaire's Disease is suppressed by copper tubing in air-conditioning systems. Copper(II) sulfate is used as a fungicide and an agent to control algae in domestic lakes and ponds. It is used in gardening powders and sprays to kill mildew. As a component in ceramic glazes, and to color glass. Alloyed with zinc to form brass, it is used in musical instruments and decorative items. Various bronzes, composed of copper, tin, and other elements (such as aluminum, manganese, or silicon) are used in making bells, cymbals, sculptures, and industrial components. Copper compounds (such as Fehling's solution) have applications in chemistry. As a lining for parts of ships to protect against the buildup of barnacles and mussels. It was originally used pure but was later superseded by a form of brass called Muntz metal. The Inuit sometimes used copper to make the cutting blade for ulu knives. Copper is essential in all higher plants and animals. Copper is carried mostly in the bloodstream on a plasma protein called ceruloplasmin. When copper is first absorbed in the gut, it is transported to the liver bound to albumin. Copper is found in a variety of enzymes, including the copper centers of cytochrome c oxidase and the enzyme superoxide dismutase (containing copper and zinc). In addition to its enzymatic roles, copper is used for biological electron transport. The blue copper proteins that participate in electron transport include azurin and plastocyanin. The name "blue copper" comes from their intense blue color arising from a ligand-to-metal charge transfer (LMCT) absorption band around 600 nanometers. Most molluscs and some arthropods such as the horseshoe crab use the copper-containing pigment hemocyanin rather than iron-containing hemoglobin for oxygen transport, so their blood is blue when oxygenated rather than red. As noted above, copper is a biostatic material, and copper surfaces will not allow bacteria to grow on them. It is believed that zinc and copper compete for absorption in the digestive tract, so that a diet that is excessive in one of these minerals may result in a deficiency in the other. The Recommended Dietary Allowance (RDA) for copper in normal healthy adults is 0.9 milligram (mg)/day. All copper compounds, unless otherwise known, should be treated as if they were toxic. In humans, 30 grams of copper sulfate is potentially lethal. The suggested safe level of copper in drinking water for humans varies depending on the source, but tends to be pegged at 1.5 to 2 mg/L. The Dietary Reference Intake (DRI) Tolerable Upper Intake Level for adults of dietary copper from all sources is 10 mg/day. In toxicity, copper can inhibit the enzyme dihydrophil hydratase, an enzyme involved in hemopoiesis. A significant portion of the toxicity of copper comes from its ability to accept and donate single electrons as it changes oxidation state. This catalyzes the production of very reactive "free radicals," such as the hydroxyl (OH) radical, in a manner similar to fenton chemistry. This catalytic activity of copper is used by the enzymes that it is associated with and is thus only toxic when unsequestered and unmediated. The increase in unmediated reactive radicals is generally termed "oxidative stress" and is an active area of research in a variety of diseases where copper may play an important but more subtle role than in acute toxicity. An inherited condition called Wilson's disease causes the body to retain copper, since it is not excreted by the liver into the bile. This disease, if untreated, can lead to brain and liver damage. In addition, studies have found that people with mental illnesses such as schizophrenia had heightened levels of copper in their systems. It is, however, unknown at this stage whether the copper contributes to the mental illness, whether the body attempts to store more copper in response to the illness, or whether the high levels of copper are the result of the mental illness. Too much copper in the water damages marine life. The observed effect of these higher concentrations on fish and other creatures is damage to gills, liver, kidneys, and the nervous system. When powdered, the metal is a fire hazard. Also, at concentrations higher than 1 mg/L, copper can stain clothes and other items washed in the water. 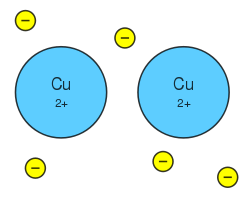 Common oxidation states of copper include the less stable copper (I) state, Cu1+, and the more stable copper (II) state, Cu2+. The latter forms blue or blue-green salts and solutions. Under unusual conditions, a 3+ state and an extremely rare 4+ state can be obtained. Copper (I) and copper (II) are also referred to by their common names, cuprous and cupric, respectively. Copper(II) carbonate is green. This compound produces the unique appearance of copper-clad roofs and domes of some buildings. Copper(II) sulfate forms a blue crystalline pentahydrate, one of the most familiar copper compounds in the laboratory. It is used as a fungicide called Bordeaux mixture. There are two stable copper oxides: copper(II) oxide (CuO) and copper(I) oxide (Cu2O). These oxides are used to make yttrium barium copper oxide (YBa2Cu3O7-δ) or YBCO, which forms the basis of many unconventional superconductors. Copper (I) compounds : copper(I) chloride, copper(I) oxide. Copper (II) compounds : copper(II) carbonate, copper(II) chloride, copper(II) hydroxide, copper(II) nitrate, copper(II) oxide, copper(II) sulfate, copper(II) sulfide. ↑ Copper Minerals Education Coalition. Retrieved June 20, 2013. NOAA and Univ. of Delaware, Horseshoe Crab Fun Facts Accessed December 12, 2005. “Role of Fenton chemistry in thiol-induced toxicity and apoptosis.” Radiat Res. 145.5 (May 1996): 542-53. “Metals, Toxicity and Oxidative Stress.” Current Medicinal Chemistry 12.10 (May 2005): 1161-1208. This page was last modified on 20 June 2013, at 15:17.